Different shapes, different flavors, different textures, scones are two widely different things on either of the Atlantic. England and America may have that ‘special relationship’ but when it comes to scones they are as different as chalk and cheese, and as different as Julia Child and Paula Dean. 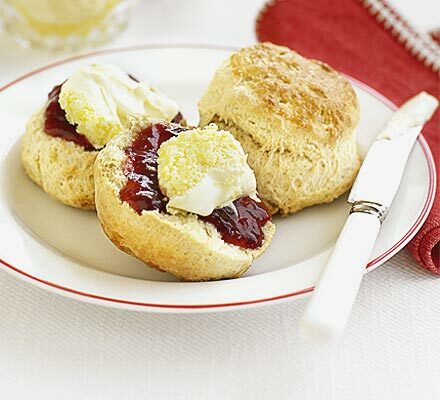 The buttery, rich dense American scone is a very dissimilar from the fluffy, delicate and more refined British scone. Both are equally delicious and there is certainly a time and a place for each version. A quintessential part of Afternoon tea, a proper British scone is round, tall, and has an extremely light texture with a crust like exterior. They are not as sweet or as rich as an American scone, and generally they are a lot smaller. They require a very light touch, it is vital the mixture is handled as little as possible otherwise they can become tough. Scones frequently include sultanas in the mixture or can be plain – both are just as good. Found in teashops around the country scones are considered a teatime ritual in England, and a key component of a cream tea. The traditional way to eat one is to split the scone in half, thickly spread each half with clotted cream and top with strawberry jam. And ordered me a buttered scone’. No matter how you pronounce it, a good scone is something to look forward to. They taste even better served with copious amounts of clotted cream, consumed on a sunny day while relaxing in the garden. A staple of most coffee shops, the American scone is frequently large and triangular shaped with a rustic, craggy exterior. 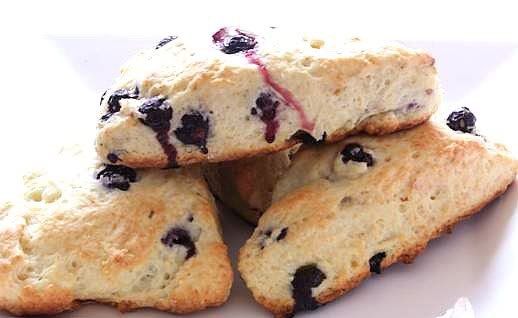 Compared to an English scone it is more buttery and contains fruit in the center such as blueberries, raspberries and topped with a sprinkling of sugar. I have never seen an American scone served with jam and clotted cream, which is probably a good thing as it would not be a combination that would work too well. Until you have tried a proper British scone it is very hard to imagine the difference between the two baked items. The table below explains all. If you would like to have a go at making a traditional English Fruit Scone, click here for one of my favorite recipes.